Ford, like many other car companies, realized years ago that the auto markets throughout the world have very distinct differences, differences that can make it nearly impossible to market the same car in two different places. They realized, for example, that Australians liked big, rear-wheel drive cars, while Europeans loved small, front-drivers. This is, in part, a function of the differing geographies of the areas, such that Australia is a country that, much like the US, has tons of wide open space, very conducive to smokey burnouts in the middle of the bush. Europe, however, is a network of cramped cities, many of them having been designed back when vehicle speeds were limited to the literal number of horses you had. The Smart car was designed in Europe, where the ability to perpendicular park in a parallel parking spot gained it adoring fans. European drivers also have to deal with heavy gas and engine size taxes, so while one of the most common engine sizes here is 3.5L, they've got 1.3L cars all over the place. I told my British roommates that my car's engine displaced 2.8L, and their jaws dropped. At the same time, as I mentioned in my post, Americans have had the mentality for years that price equals size. Geo Metros were small, so they had to be cheap. In Europe, that's just not the case. The Focus in the UK starts at £11,695 and goes up to £17,995. With today's conversion that's a range of $23,318 to $35,879. Can you imagine paying around $36K for a Focus…before taxes? That mentality has slowly begun to change in this country, though. You can spend over $30K on a Mini, which is smaller than a Chevy Aveo available for $10,560. The Mini had a fresh start with its brand, which would be a problem for Chevy or Ford in this country. And it's not just the American companies that have acknowledged this. The European Honda Accord is smaller and more upscale than the American one. In fact, Honda does sell it here, but uses the Acura brand to get the kind of asking price that car deserves. It's called the Acura TSX, and it only offers a 4-cylinder engine, something that wouldn't fly in this country as an Accord. The VW Golf is the best-selling car in Europe, and has been for years. 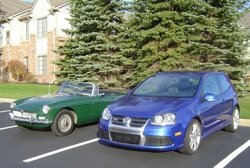 But while it's a vastly superior car to the Chevy Cobalt or the Cavalier that preceded it, the Chevys have outsold it handily, since the Golf was always a bit more expensive. Well, that and the fact that Americans love their Chevys. GM is trying a move-up strategy with Saturn, a brand that was pretty established but, quite frankly, needed a makeover. The current Saturn Ion was one the most hated cars by the US magazines. Car and Driver called it "probably the most disappointing all-new American car in a decade." So they're starting over. The only nameplate they've retained is the reasonably successful Vue. Even that vehicle they've replaced in all but name with the Opel Antara. As far as the Ion is concerned, they've ditched it completely, bringing over the Opel Astra, a car which sells for roughly the same price as the Focus is Europe. The car will be priced lower here, which means that while GM is rebuilding the Saturn brand, it will probably take a bit of a financial hit on that car. But they understand that you can't just take a brand's price point very far north before the brand itself has begun moving in that direction. The correct way to execute a brand turnaround is with improved product at similar prices. Hyundai is well on its way down this path. Once the public realizes that the product is better, you can start charging more. This can be a slow and very painful process. But it's necessary, since brand value is so ingrained. To answer one of my brother's questions, I think that Ford actually does have more cachet in Europe…ironically. They are about on the level with VW there. I think part of the reason is that they have other cheap brands there that we don't have here, such as Skoda (Czech, owned by VW) and Daihatsu (Japanese, owned by Toyota). So Ford has been slower in Europe to "race to the bottom", looking for pure volume numbers as opposed to profitability. Consequently, last year while Ford North America was bleeding profusely, Ford of Europe made a nice buck. The fact is though, that our world is always shrinking. A great idea invented and proliferated in Europe, such as the relatively more efficient diesel engine, is finally gaining a foothold here. So ideas should start to flow more freely between continents. As carmakers come up with platforms that are more flexible, and can be marketed in more than one country through more than one brand, we may see a big benefit as consumers. I think GM's off to a good start, in several different areas. But the question will continue to be very complicated, especially with the Koreans and Chinese, and eventually Indian manufacturers that will continue to make cars cheaper and cheaper. Well, that's it for now. Let it be noted that, while I've absorbed a lot in the past few years of working in the industry, I still have plenty to learn. I'm sure all my adoring fans who stick with me down the road will witness my continuing education. Until then, if you have any more questions about how the industry works, post a comment and I'll be happy to give it a go.